CPHA acknowledges and thanks the Lawson Foundation for its generous support. We also thank all those who were also funded through the Lawson Foundation’s Outdoor Play Strategy for their continuing support in reviewing and providing direction for various components of this work. The Advisory Committee for this project deserves special thanks for its ongoing direction and support that led to the project’s successful completion. In December 2015, the Lawson Foundation, through its Outdoor Play Strategy, provided a grant to the Canadian Public Health Association (CPHA) to develop a risk mitigation policy toolkit in support of children’s access to play. The goal was to “Improve Canadian children’s access to free play, including adventure play areas, through the development of a policy toolkit that provides methodologies and approaches that respond to municipal managers,’ school board officials’ and elected municipal officials’ concerns, and parental perceptions regarding the liabilities and risks of risky play.” This work subsequently focused on unstructured play,a of which risky play is a subset. The results can be found in the Children’s Unstructured Play Toolkit, of which this paper is a part, together with seven research briefs, five infographics, six policy tools, and a collection of promising practices. The paper also led to CPHA’s position statement on Children’s Unstructured Play, and the identification of the complex problems that are the subject of this discussion paper. Unstructured play is the business of childhood.3 It is an integral part of every child’s healthy development and is embedded as Article 31 of the Convention on the Rights of the Child. All children and youth have a need for time, appropriate space and opportunity to engage in unstructured play, take risks and realize the associated benefits. Children’s access to unstructured play provides the foundation for improved physical, psychological and social health, and supports improved resilience as adults. Public health is an approach to maintaining and improving the health of populations that places health promotion, health protection, population health surveillance and the prevention of death, disease, injury and disability as the central tenets of all related initiatives. It is also based on the principles of social justice, attention to human rights and equity, evidence-informed policy and practice and addressing the underlying determinants of health. Public health initiatives are based on evidence of what works or shows promise of working.27 This intersection makes access to unstructured play both a public health and a health promotion issue. Within this intersection is an underlying tension between those who wish to reduce the likelihood of injury resulting from children’s unstructured play, and those who recognize the medium- and long-term physical, psychological and emotional benefits of unstructured play with its inherent risks. It is also known that consistent exposure to active, outdoor play further develops movement skills that prevent injury as children are more aware of how their bodies move. The resolution of this tension is difficult as there is substantial evidence supporting the benefits of unstructured play, while the data concerning the likelihood of injury resulting from play are limited by the description of where and how the injury occurred, thereby making it difficult to identify the actual cause of the injury. Similarly, it is difficult to compare the number of children injured during play, and the severity of those injuries, with the number of injuries that result from participation in organized sports. The reason for this difficulty is that there is no information available in Canada concerning the number of children taking part in unstructured play, or the accumulated exposure (duration), that can be compared to the known number that participate in organized sports. One systematic review has examined the medically-treated injury incident rates (injuries per 100 hours) in organized versus unorganized physical activities.28 This study identified that the absolute number of injuries was higher in unorganized physical activities as compared to organized physical activities; however, the respective injury incidence rates were generally lower during unorganized leisure time. What might be done to reverse the trend? The O’Brien Institute for Public Health prepared a summary of “reputable sources of data to paint a high level picture of children in Canada.”36 This paper noted that, in 2016, there were approximately 7.8 million children and youth (aged 0 to 19 years). However, as a country, the percentage of seniors (adults 65 years of age and older) now exceeds the number of children and this trend is expected to grow. In terms of a percentage of the population, children in the age group of 0 to 14 years are expected to decrease from 16.6% in 2016 to 15.9% by 2036, while the total number of children is expected to grow as the overall population grows. Complicating this factor is the geographic distribution of these children: the Atlantic Provinces, Quebec and Ontario are expected to have greater percentages of seniors than children, while the Western provinces and Northern territories will likely have greater percentages of children aged 0 to 14 years than seniors. Further complicating these demographics is the diversity of Canada’s children. In 2016, approximately 2.2 million were from first- or second-generation immigrant families and this number is expected to increase. The challenge within this cadre is to understand and respond to their cultural perception of play, and to work with the families to provide them with the culturally relevant information necessary to make informed decisions. The challenge in reporting demographic information is that these data have not been consistently collected over the years, thus making the development of a valid projection of future population changes difficult. Despite this shortcoming in the data, it is clear that the increasing number of children from immigrant and Indigenous families will require the development of play opportunities that are culturally appropriate and inclusive in nature. This scenario is further complicated by the influence of socio-economic status (SES) on the health of children. It is known that those at the lower end of the social gradient are more likely to have poorer health outcomes than those at the higher end, while persons of colour and Indigenous people are overrepresented at the lower end of the social gradient. One study has shown that 76% of low-income children under the age of five in Toronto were visible minorities. Negative health outcomes are especially evident for low SES children, where infant mortality (a common measure of child health outcomes) was found to be significantly higher in the lower fifth of Canadian urban neighbourhoods (6.5 per 1000), compared to the richest fifth (3.9 per 1000).40 This effect extends beyond infant mortality to include poorer physical health, emotional and behavioural outcomes, school readiness and learning, low birth weight and obesity. Similarly, children in low SES neighbourhoods appear more likely to suffer fatal and non-fatal injuries. These higher injury rates have been explained by factors such as the quality of housing and lack of availability of safe play areas. The challenge with much of the injury prevention and health data, however, rests in the availability of timely, consistent and comparable national data that provide a clear indication of the nature and severity of the injury, and geographic location where it occurred. The limited availability of public funding to support the development of play spaces is also problematic. In many situations, funding for these spaces is provided through parent-led fund-raising activities. This option, however, is limited within low SES communities where parents are less likely to have the funds and time necessary to take on fund-raising activities, which reduces the potential for success. As such, it is important to consider the SES of the community when developing play opportunities, and place specific emphasis on communities with lower SES. Geographic or socio-economic factors that can limit access to safe play spaces in rural or urban environments. Supervision is needed for infants and toddlers; however, the previously mentioned parental concerns should be balanced against the benefits of age-appropriate unstructured play, especially between the ages of 6 and 12 years. For that age group, “helicopter” parenting, hyper-parenting and other forms of extreme parenting (e.g., tiger parenting, attached parenting, free-range parenting, and dragon mothers)43 can be perceived as a loss of trust between parents and their children.44 Hyper-parenting, in particular for children with physical disabilities, may have a detrimental effect on children’s mental wellness, resulting in psychological problems and reduced self-confidence.45 Over-protective or hyper-parenting can limit a child’s ability to freely roam to engage in unstructured play. For example, children’s independent mobility (the distances they are allowed to travel without adult supervision) has decreased between generations.46,47 Independent mobility directly affects a child’s access to play48 as children who can travel greater distances are more likely to meet and play with peers,49 be more physically active, and play outdoors more regularly.25 Lack of independent mobility also affects a child’s ability to travel (walking or by bicycle) to school by him/herself. Being a leader within a subgroup of a social network. They are successful when their behaviour makes other members pay attention or respond to their behaviour. This success is often achieved through frequent and personally motivated interactions that are dynamic, and can be reversed if the connections are disrupted. Within our communities, social referents can either create disruptions that can reduce access to play (for example, leading a movement to close a toboggan hill) or act as a leader to increase access to play spaces. Complicating this scenario is the way in which individuals hear and interpret information. Social cognitive theory,b in particular heuristics,c may influence decision-making by those in authority. In this case, those who are most vocal on a subject or affected by a situation may influence a decision even though they may neither represent the majority viewpoint nor be supported by the evidence. For example, a decision-maker may choose to close a toboggan hill based on the comments provided by a single parent or small group of parents who have been affected by an injury to a child, without fully considering the events leading to the injury. These perceived social norms can also be acted upon through a strategy whereby countervailing information about the situation is disseminated broadly as a means of counteracting the influence of the undesirable norms (social comparison strategy).52 This information can be either positive or corrective in nature, but care must be taken to prevent unintended consequences. For example, excessive praise for a specific action may result in a negative response. This effect can be overcome by providing broader summary information rather than highlighting specific cases. Social influence strategies are especially relevant to the current use of social media. Social networking sites (SNSs), such as Facebook and Twitter, provide a platform through which new social connections and networks develop and often influence individuals’ behaviours. These interventions generally involve a combination of system- and user-generated content, thereby fostering multidirectional communication that is participatory and engaging.56 On an individual basis, SNS interventions promote comparison by allowing members to observe each other’s behaviours, which leads them to adjust their behaviour.57 One large randomized controlled trial showed that prior positive ratings (i.e., up-votes) on social media posts may change the collective opinion of that post by spawning further positive ratings.58 On the group level, the strategic dissemination of summary information (i.e., “what most people are already doing”) can influence perceived social norms and drive group members’ behaviours in the direction of the desired norm. These interventions are more likely to successfully nudge users to adopt behaviours congruent with the desired values, and may prime users to accept certain information more readily. When these approaches are applied to play, it should be possible to counter the influence of those who choose to limit access to play (either intentionally or unintentionally) by developing and providing evidence-informed information to the parent, guardian, educator, child care practitioner or decision-maker in a form and structure with which they are comfortable. The messages could focus on the benefits of unstructured play, and the importance of child independence in play, while reframing perceptions of risk. Decision-makers are especially important to influence so that they are knowledgeable and capable of responding to those who would limit access to unstructured play. In Canada, the legislative and regulatory authorities that influence children’s access to play are the responsibility of provinces and territories. These authorities include Acts that deal with education, define requirements for early childhood care, and affect liability. The assignment of these responsibilities to provinces and territories allows those jurisdictions to develop and implement programs that meet the needs of their citizens, as these interests may vary from province-to-province and territory-to-territory. It also establishes a tapestry of authorities, roles and responsibilities that limits the development of a national perspective. Irrespective of this concern, there are several considerations that affect access to play in all provinces and territories. Each of the thirteen education acts in Canada provides a framework of requirements for educating the children of the province or territory. The responsibility for implementing these requirements is delegated to local school boards that can establish policies and programs to meet the needs of the school district, while implementation is often assigned to the local school. This complex series of relations can influence decision-making at all levels and result in inconsistencies in the application of programs and decisions concerning, for example, the effect of inclement weather on access to outdoor recess or when recess may be withheld as a disciplinary measure. This scenario is further influenced by educators’ collective agreements that define, among other things, supervision requirements and ratios. Restricting or prohibiting outdoor play or recess periods during inclement weather. Complicating this scenario is the perception, by some educators, that they may be held liable or disciplined if a child is injured while under their supervision. This concern is embedded in the duty of care educators have that is described in provincial or territorial education acts (that of a careful and judicious parent or similar to that of a kind, firm and judicious parent (loco parentis) coupled with the perceived standard of care. Similarly, educators often believe that that they do not have adequate training in or direction to promote physical activity, and that expected practices limit their ability to promote unstructured play.64 Similarly, within a childcare setting, those practitioners may prioritize child supervision and safety over their need to be physically active.65 Complicating this concern are: the time needed to prepare children for outdoor environments; and the challenges faced in providing watchful guidance.66 Although these findings are related to the provision of services in childcare centres, similar responses were provided during our interviews of educators.67 As a result, educators’ responsibilities regarding access to recess should be clarified and consistently applied across school board jurisdictions. In addition to education acts, each province and territory has developed and implemented childcare, daycare, early learning or early years’ acts, with the name of the act dependent on the province or territory. These acts generally define the responsibilities and requirements of facility managers and/or early childhood educators, including supervision and programming details and supervisory and operational requirements. These acts also typically provide licensing and compliance schemes, funding and allocation of resources to childcare, childcare accommodations and implementation in specific provinces or territories. Information may also be provided to help families appropriately choose childcare services and programs. As such, families can have better understanding of information relating to childcare and how childcare services and programs operate. Childcare acts are continually reconfigured to better reflect the goal of providing children and families with adequate care for the early years of children’s lives. They are influenced by the perspectives of parents and families to better reflect the world in which the children live. The level of direction contained in these acts is often in stark contrast to that provided by education acts, which deal principally with the duties to support the safety and education of students, while the provision of services is defined in school board policy and operationalized at the school level. This difference is especially evident when early childhood education and care (ECEC) programs are co-housed within schools as rules affecting the provision of ECEC services are often substantially different from those used when school is in session. Also, failure to adhere to childcare acts and their regulations can result in administrative penalties, fines, compliance orders, and other penalties that are relative to the length and severity of violations. As with education and childcare acts, liability and negligence falls within the responsibilities of provinces and territories, with each providing its own legislative base. Six provinces have developed a provincial occupier’s liability act (BC, AB, MB, ON, NS and PEI) while three others and the three territories rely on common law, case law and related statutes (SK, NL, NB, NWT, NU and YT). The province of Quebec relies on its Civil Code and case law. Although the uniqueness of these approaches may limit the applicability of jurisprudence from one province or territory to another, they are all based on the owner’s responsibility to make their premise “reasonably” safe and are affected by joint and several liability. Such an approach is in stark contrast to that used in Norway. This country supports a lifestyle that embraces outdoor living, including access to unstructured or risky play. In supporting this approach, the responsibility for managing risk falls on the person entering the property, as opposed to the Canadian approach that places responsibility on the owner of the property. It is recognized that these are two fundamentally opposing approaches to addressing a single issue, but it hints at the core societal shifts in Canada that have resulted in the movement away from unstructured play. The interviews that were undertaken for this work have shown that, in Canada, municipalities and school boards are concerned with the possibility of child injury on their properties, and the likelihood of encountering a legal claim (often driven by parent or caregiver complaints) with its resultant effects on decision-making.67 Municipalities have, for similar reasons, implemented by-laws to restrict play, including fines for climbing trees, bans on street hockey or street play, or requiring permits to access public space for play. These safety requirements are often implemented without consideration of child development needs, the actual likelihood of an accident, or the potential severity of injury. Such decision-making limits (e.g., prohibiting tobogganing on hills) come into effect when, for example, play apparatus, structures, activities or opportunities are removed in order to reduce the likelihood of injury. Such decisions appear to run against the notion of maintaining a “reasonably safe” play space. The challenge is to separate the consideration of safety (the removal of hazards from the site) with access to challenging play (the ability for children to test their limits). The view of many play experts is that play spaces should be ‘as safe as necessary,’ not ‘as safe as possible.’ That is, hazards need to be removed, but acceptable risks ought to remain in order to permit the long-term benefits of unstructured play. This separation is complicated by the Canadian Standards Association’s (CSA) standard for “Children’s Play Spaces and Equipment” (CAN/CSA-Z614). This standard provides a foundation for playground safety that is designed to minimize the likelihood of serious and/or life-threatening injuries, but is not intended to address child development needs. It is voluntary and its intended use is not specified. Therefore, the user determines its application. Common practices associated with play spaces, however, are strongly influenced by this standard as they may be applied as a minimum safety requirement or safety guideline by decision-makers. As such, injury prevention is valued while the social, psychological and physical benefits of unstructured play may not be considered. This concern has been the subject of a recent international discussion document concerning risk, liability and children’s play in public spaces.73 It has highlighted, in part, the need for: better data on the cost and prevalence of litigation; engagement of insurers, risk managers, and the legal profession in risk-benefit discussions; promotion of a risk-benefit analysis approach to assessing safety; and developing a proportionate risk management approach. Such approaches are also required in Canada and could be supported by a community consultation process across the country. The goal of such a consultation would be to gain an understanding of the local concerns of all stakeholders, and evaluate the benefits and challenges associated with supporting unstructured play in communities. As a result, a common approach could be developed that supports children’s happiness while permitting the development of the skills and competencies necessary to succeed as adults. Underlying the concerns associated with liability and negligence is the principle of joint and several liability, whereby a successful plaintiff (the injured party) in a liability lawsuit may recover up to 100% of the compensation awarded from the defendant who is able to pay, regardless of the degree to which that defendant is found to be negligent. Due to this principle, school boards and municipalities are often included in lawsuits even though they may have minimal responsibility for the underlying incident. As a result, some municipalities and school boards have been known to eliminate activities that have elements of risk, and to install processes and play equipment that minimize the possibility of injury. While some insurance providers have demonstrated a willingness to settle out of court rather than to pursue a judicial outcome, others have assumed a claims philosophy where they only pay when there is negligence. As such, consistent approaches concerning the assessment of risk and the payment of claims would provide support for improved implementation of play policies, and provide a basis on which to develop a risk-benefit analysis approach that provides children with the opportunity to receive the benefits associated with unstructured play. Steps should be taken to reform joint and several liability so that the compensation paid towards an injured party is directly proportional to the degree to which the defendant is negligent. One province has reconsidered the assignment of negligence payments. The Province of Saskatchewan’s Negligence Act provides for the “apportionment of damage or loss” and dictates that if a defendant cannot afford their proportion of the liability damages, the remaining amount will be equally apportioned among all parties. This could include the plaintiff if they are found partially negligent. Such an approach appears to reduce the costs that may result from a successful lawsuit in Saskatchewan, but further analysis is required to determine its applicability to other provinces and territories. Structural violence is often associated with poverty, race and social suffering, and efforts are being undertaken by many aspects of society to identify and respond to those institutions that have developed, implemented and maintained systematic approaches and processes that cause others harm. Structural violence can also manifest itself when any basic need is interrupted.75 One of the overlooked interruptions is the basic need for children to engage in unstructured play. Throughout this discussion paper, efforts have been made to identify those challenges resulting from current societal, judicial and legislative approaches that have unwittingly resulted in limiting the emotional, social, physical, and mental potential of our children. The challenge is to identify where these harms are occurring and to determine how best to reverse them. Throughout Canada, there is a growing cadre of individuals and organizations that recognize the benefits of children’s unstructured play and the challenges caused by a shifting social and regulatory landscape. They are working to address these challenges at local, provincial, territorial and national levels, and are having success in reversing the trends away from structured play. There are, however, several wicked problems that limit their activities but could provide clues to reversing the movement away from unstructured play. These challenges have been separated into three broad categories, and suggestions are made to address these issues. Canada is a country of many cultures. As a result of this diversity, steps must be taken to be culturally aware, sensitive and attentive to the needs and concerns of these cultures. This is especially true as we respond to the harms caused to Indigenous peoples and the Calls to Action of the Truth and Reconciliation Commission. Complicating these actions is the influence of socio-economic status on access to play. Provide cultural humility, competence and sensitivity training for all involved in providing access to play for children. Facilitate access to play so that every child in Canada has equal access to safe play sites and locations, and programs that support unstructured play. Support Indigenous peoples’ development and implementation of play programs for their children. Provide funding for safe play site developments and play programs for low socio-economic status communities. Encourage a social climate where outdoor play is normal and valued in a variety of settings. Parents, caregivers, educators, children and decision-makers are all subject to the influences of our changing communications landscape. These influences can range from the influence of parental peer pressure, to the way in which decision-makers respond to a complaint. It also speaks to the way that people hear, perceive and assimilate information. These influences can be counteracted by providing the best available information to those who need it in a format that is clear, concise and understandable. Such approaches would include, for example, the use of social media to influence the general population, provision of evidence-supported information to decision-makers, and identifying and supporting local champions. Similarly, governmental and corporate interests can influence how people react to information and the decisions they make by taking actions that provide clear support for and programs that foster access to play. Develop and implement overarching communications and social media strategies that provide information on the benefits of unstructured play for use by parents, caregivers and educators. Building on the success of the Calgary Play Charter, support and develop similar efforts in other municipalities, to further influence communities across Canada. Consider developing a play friendly city designation that supports the development of a National Play Charter and provides a road map for communities to become play friendly. Invest in a creative, multi-level, multi-sectoral, multi-modal, sustained national outdoor play communications and social media campaign. The provinces and territories provide the overarching legislative framework that addresses access to play. This situation allows each jurisdiction to tailor its approaches to meet the needs of its citizenry. It also provides a level of complexity that limits the development and implementation of national approaches. Similarly, within each province and territory there are specific acts and regulations that address education, the provision of childcare, and liability and negligence law with their associated complexities that could result in inconsistencies in approaches. Develop a discussion document summarizing the legislative, regulatory and insurance differences in Canada. Develop a summary of the available jurisprudence concerning play-based litigation. Prepare a comparison document summarizing the legislative and regulatory differences of peer-countries. In their simplest form, education acts describe the requirements and processes necessary to provide education for children. This direction is used by school boards to develop programs and approaches in the communities they serve, and provide it to schools for implementation. As this direction moves through the various systems, inconsistencies in application can develop between school boards and among schools. Underlying these concerns is the concept that educators should manage children as would a careful and judicious parent (loco parentis) without providing an underlying framework on which to assess whether the requirement is being met. Notable among these considerations are the rules concerning access to recess. Childcare acts, on the other hand, provide specific direction concerning the development of childcare spaces, with limited direction on programming. Within each province and territory, develop and implement programs and policies consistently among school boards and between schools. Within each province and territory, review education and childcare acts with respect to their consistencies and inconsistencies and then develop and implement legislation or administrative processes that support consistent access to unstructured play in both settings. Develop and implement consistent approaches to recess as a means of ensuring that every child has access to unstructured play in the school setting every day. Develop a framework on which to assess whether an action meets the loco parentis requirement of the law. Develop and implement legislation isn support of universal, professionally delivered ECEC programs. The issues of liability and negligence also fall under provincial and territorial law. Under the current statutes, six provinces have established occupier’s liability acts, three provinces and three territories rely on common and case law, while Quebec has established an approach based on their Common Law. Underpinning each situation is the concept of what might be done by a reasonable person, while leaving the Courts the ability to determine whether an action is reasonable. A second challenging principle is that of joint and several liability, which provides direction on how an award should be paid and may result in the inclusion of school boards and municipalities in lawsuits for circumstances in which they have limited influence. An additional concern is the manner in which risks and hazards are assessed, and by extension the notion of “reasonableness.” In Canada, the principal standard used in assessing play products and spaces was developed from the perspective of injury prevention, without considering child development requirements. A risk-benefit analysis framework and approach would provide a more equitable balance between injury prevention and child development while potentially addressing the concept of reasonableness. 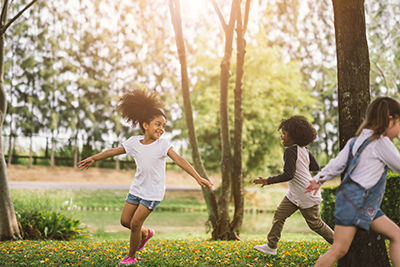 Review the available jurisprudence concerning liability and negligence related to children’s play with a view to establishing a framework to describe “reasonableness” that could be considered nationally. Reform joint and several liability with a view to providing greater agreement between the degree of responsibility of the defendant and the amount of the award that must be paid. Develop an approach to risk-benefit analysis for children’s play spaces based on current Canadian law and seek concurrence for its use by all partners and stakeholders. Underlying many of these concerns is the need for timely, accurate and comparable data and information that can be used to develop effective policy that balances the elimination of hazard with the benefits of unstructured play. Currently available data are often dated, and do not provide the level of detail necessary to make informed decisions or to effectively compare information from different jurisdictions. Efforts are necessary to renew the current approaches and develop the underlying processes and procedures to provide clear easily assimilated information that reflects the Canadian situation to those who need it. a The term unstructured play does not have an academic definition, but has come to be used as a generic term to represent child-led play that takes place preferably outdoors but also indoors, and includes the concept of risky play. Its use was developed to reflect the concerns of decision-makers regarding the use of the term “risky” to describe play. b Social cognitive theory is the view that people learn by watching others – in psychology, it explains personality in terms of how a person thinks about and responds to one's social environment. (For a further description, please refer to: http://sphweb.bumc.bu.edu/otlt/MPH-Modules/SB/BehavioralChangeTheories/BehavioralChangeTheories5.html). c Heuristics are mental shortcuts that allow people to solve problems and make judgements quickly. These rule-of-thumb strategies shorten decision-making time and allow people to function without continually stopping to think about their next course of action. Heuristics are helpful in many situations, but they can also lead to cognitive biases. For a more complete definition of heuristics please refer to: https://www.verywellmind.com/what-is-a-heuristic-2795235. Rittel, H. and Webber, M. 1973. Dilemmas in a general theory of planning. Policy Sciences; 1973: 155-169. Austin Centre for Design, ND. An introduction to wicked problems. Problems worth solving. Piaget, J. 2007. The Child’s Conception of the World: a 20th-Century Classic of Child Psychology (2nd Ed). New York, NY: Rowman & Littlefield Lanham. Hughes, B. 2018 Sixteen different types of play. Rock, A. 2018. Unstructured play for children. Sandseter, E.B.H. 2009. Characteristics of risky play. Journal of Adventure Education and Outdoor Learning 9(1):2-21. Council of Chief Medical Officers of Health (CCMOH) 2018. The Council of Chief Medical Officers of Health supports the position statement on active outdoor play. Pan-Canadian Public Health Network. Brussoni, M., Olsen, L.L., Pike, I. and Sleet, D. Risky play and children’s safety: Balancing priorities for optimal child development. Int J Environ Res Public Health 2012, 9, 3134–3138. Engelen, L., Bundy, A.C., Naughton, G., Simpson, J.M., Bauman, A., Ragen, J., Baur, L., Wyver, S., Tranter, P., Niehues, A., Schiller, W., Perry, G., Jessup, G. and van der Ploeg, H.P. Increasing physical activity in young primary school children—It’s child’s play: A cluster randomised controlled trial. Prev. Med. 2013, 56, 319–325. Gray, C., Gibbons, R., Larouche, R., Sandseter, E.B.H., Bienenstock, A., Brussoni, M., Chabot, G., Herrington, S., Janssen, I., Pickett, W., Power, M. 2015. What is the relationship between outdoor time and physical activity, sedentary behaviour, and physical fitness in children? A systematic review. Int J Environ Res public health. 12(6):6455-74. Sandseter, E.B.H. and Kennair, L.E.O. Children’s risky play from an evolutionary perspective: The anti-phobic effects of thrilling experiences. Evol. Psychol. 2011, 9, 257–284. Burdette, H.L. and Whitaker, R.C. 2005. Resurrecting free play in young children: looking beyond fitness and fatness to attention, affiliation, and affect. Archives of pediatrics & adolescent medicine. 159(1):46-50. Lavrysen, A., Bertrands, E., Leyssen, L., Smets, L., Vanderspikken, A. and De Graef, P. 2017. Risky-play at school. Facilitating risk perception and competence in young children. Eur. Early Child Educ. 25(1):89-105. Panksepp, J. 2007. Can play diminish ADHD and facilitate the construction of the social brain? J Can Acad Child Adolesc Psychiatry 2007; 16: 57–66. Strong, W.B., Malina, R.M., Blimkie, C.J., Daniels, S.R., Dishman, R.K., Gutin, B., Hergenroeder, A.C., Must, A., Nixon, P.A., Pivarnik, J.M. and Rowland, T. 2005. Evidence based physical activity for school-age youth. The Journal of Pediatrics. 146(6):732-7. Tillmann, S., Tobin, D., Avison, W. and Gilliland, J. 2018. Mental health benefits of interactions with nature in children and teens: a systematic review. J Epidemiol Community Health 72: 958-966. Doi: 10.1136/jech-2018-210436. Centers for Disease Control and Prevention. 2010. The association between school based physical activity, including physical education, and academic performance. Atlanta, GA: U.S. Department of Health and Human Services. Williamson, D., Dewey, A. and Steinberg, H. 2001. Mood change through physical exercise in nine- to ten-year-old children. Perceptual and motor skills. 93(1):311-6. Sandseter, E. B. H. (2011). Children’s risky play in early childhood education and care. ChildLinks, 3, 2-6. Little, H. (2008). Thrills (and spills?) in the playground: Describing children's physical risk taking behaviour during outdoor play. 18th European Early Childhood Education Research Association (EECERA) Annual Conference, Stavanger, Norway, 3-6 September. Armitage, M. (2011). Risky play is not a category–it’s what children do. ChildLinks. Children’s Risky Play, 3, 11-14. Khanlou, N., and Wray, R. 2014. A Whole Community Approach toward Child and Youth Resilience Promotion: A Review of Resilience Literature. International Journal of Mental Health and Addiction. Brussoni, M., Gibbons, R., Gray, C., Takuro, I., Sandseter, EB.H., et al. 2014. What is the relationship between risky outdoor play and health in children? A systematic review. Int J Environ Res Public Health. 12(6):6423–54. ParticipACTION, 2018. The 2018 ParticipACTION report card on physical activity and youth. WHO 2018. Physical activity for health. More active people for a healthier world: Draft global action plan on physical activity 2018-2030. Seventy-first World Health Assembly. 22 March 2018. Canadian Public Health Asociation, 2017. Public Health: A conceptual framework. Ottawa. Nauta, J., Martin-Diener, E., Martin, BW., vanMechelen, W., and Verhagan, E. 2015. Injury risk during physical activity behaviours in children: a systematic review with bias assessment. Sports Med 45(3): 327-336. DOI: 10.1007/s40279-014-0289-0. Lalonde, M. 1974. A new perspective on the health of Canadians. A working document. Health and Welfare Canada, 1986. Achieving health for all: A framework for health promotion. (Epp report). WHO, 1986. Ottawa Charter for Health Promotion. First International Conference on Health Promotion. Ministers of Health, 1994. Strategies for population health: Investing in the health of Canadians. Health Canada, 1996. Towards a common understanding. Clarifying the core concepts of population health. Ministers of Health and Health Promotion/Healthy Living 2010. Creating a Healthier Canada: Making Prevention a Priority. A Declaration on Prevention and Promotion from Canada’s Ministers of Health and Health Promotion/Healthy Living. Reist, D., Norman, T., Jenie, K. et al. 2018. From avoiding risk to nurturing resilience: Shifting our upstream approach to youth substance use. University of Victoria, Canadian Institute for Substance Use Research. O’Brien Institute for Public Health, 2018. Raising Canada: A report on children in Canada, their health and wellbeing. Truth and Reconciliation Commission, 2015. Honouring the Truth, Reconciling for the Future. Summary of the Final Report of the Truth and Reconciliation Commission of Canada. Truth and Reconciliation Commission, 2015. Truth and Reconciliation Commission: Call to Action. Bauer, M.E.E. and Giles, A. 2018. The need for Inuit parents’ perspectives on outdoor risky play. Polar Record. National Collaborating Centre for the Determinants of Health, 2008. Evidence Review: The influence of socio-economic status and ethno-racial status on the health of young children and their families. Clements, R., 2004. An investigation of the status of outdoor play. Contemporary Issues in Early Childhood. 5(1):68-80. Holt, N.L., Neely, K.C., Spence, J.C., et al. 2016. An intergenerational study of perceptions of changes in active free play among families from rural areas of Western Canada. BMC Public Health 2016: 16:829. Hutton, L. n.d. Your parenting style: are you an extreme parent? Rosin, H. 2014. The Overprotected Kid. The Atlantic. Holmbeck, G.N., Johnson, S.Z., Wills, K.E., McKernon, W., Rose, B., Erklin, S., and Kemper, T. 2002. Observed and perceived parental overprotection in relation to psychosocial adjustment in preadolescents with a physical disability: the mediational role of behavioral autonomy. Journal of Consulting and Clinical Psychology. 70(1):96. Shaw, B., Watson, B., Frauendienst, B., Redecker, A., Jones, T. and Hillman, M. 2013. Children's independent mobility: a comparative study in England and Germany (1971-2010). Westminster Research. Janssen, I., Ferrao, T. and King, N. 2016. Individual, family, and neighborhood correlates of independent mobility among 7 to 11-year-olds. Preventive Medicine Reports. 3:98-102. Schoeppe, S., Duncan, M.J., Badland, H., Oliver, M. and Curtis, C. 2013. Associations of children's independent mobility and active travel with physical activity, sedentary behaviour and weight status: a systematic review. Journal of Science and Medicine in Sport 16(4):312-9. Prezza, M., Pilloni, S., Morabito, C., Sersante, C., Alparone, F.R. and Giuliani, M.V. 2001. The influence of psychosocial and environmental factors on children's independent mobility and relationship to peer frequentation. J Community Appl Soc 11(6):435-450. Paluck, E.L., Shepherd, H. and Aronow, P.M. 2016. Changing climates of conflict: A social network experiment in 56 schools. Proc Natl Acad Sci USA 2016; 113(3):566-571. Paluck, E.L. and Shepherd, H. 2012. The Salience of Social Referents: A Field Experiment on Collective Norms and Harassment Behavior in a School Social Network. J Pers Soc Psychol 103(6): 899-915. Tankard, M.E. and Paluck, E.L. 2016. Norm perception as a vehicle for social change. Soc Issues Policy Rev 10(1):181-211. City of Calgary, 2017. Calgary Play Charter. UNICEF, 2018. Child Friendly City Designation. Parachute, nd. Safe city: safe city designation. Chou, W.Y.S., Prestin, A., Lyons, C. and Wen, K.Y. 2013. Web 2.0 for health promotion: Reviewing the current literature. Am J Public Health 103(1): e9-e18. Laranjo, L. 2016. Social media and health behaviour change. In: Syed-Abdil, S., Gabaron, E. and Lau A.Y.S. (eds.) Participatory Health through Social Media, Elsevier Inc. DOI: . Muchnik, L., Aral, S. and Taylor, S.J. 2013. Social Influence Bias: A Randomized Experiment. Science 341(6146):647-651. Ginsburg, K.R. 2007. The importance of play in promoting healthy child development and maintaining strong parent-child bonds. Paediatrics 2007;119(1):182-91. Public Health Agency of Canada. 2015. Report from the Canadian Chronic Disease Surveillance System: Mental Illness in Canada, 2015. Hüttenmoser, M. 1995. Children and their living surroundings: Empirical investigation into the significance of living surroundings for the everyday life and development of children. Child Environ 1995, 12, 403–413. Jarrett, O. S. 2013. A Research-Based Case for Recess. Published Online by the US Play Coalition. Coleman, B. and Dyment, J. 2013. Factors that limit and enable preschool-aged children‘s physical activity on care centre playgrounds. Journal of Early Childhood Research 11(3): 203-221. Dyment, J. and Coleman, B. 2012. The intersect of physical activity opportunities and the role of early childhood educators during outdoor play: perceptions and reality. Australasian Journal of Early Childhood 37(1): 90-98. Olsen, H., Thompson, D. and Hudson, S. 2011. Outdoor learning: Supervision is more than watching children play. Dimensions of Early Childhood 39(1): 2-11. Canadian Public Health Association. 2018. Decision-Making Barriers to Accessing Unstructured Play: Key Informant Interviews. Yoshikawa, H., Weiland, C., Brooks-Gunn, J., Burchinal, M. R., Espinosa, L. M., Gormley, W. T., Ludwig, J., Magnuson, K., Phillips, D., & Zaslow, M. 2013. Investing in our future: The evidence base on preschool education. Ann Arbor, Michigan: Society for Research in Child Development and New York: Foundation for Child Development. Bennett, J. (Ed.). 2011. Childcare – Early Childhood Education and Care. In: Encyclopedia on Early Childhood Development Online. Early Childhood in Canada,. n.d. Empowering the Future: Best Evidence for Investing in Early Childhood Education for Canada. Canadian Public Health Association. 2016. Early Childhood Education and Care Position Statement. Ottawa. Statistics Canada. 2015. Childcare in Canada. Gill, T. 2018. Playing it safe? A global white paper on risk, liability and children’s play in public spaces. Ho K. 2007. Structural violence as a human rights violation. Essex Human Rights Review 4(2): 1-17. Rylko-Bauer, B. and Farmer P. 2016. Structural violence, poverty and social suffering. The Oxford Handbook of the Social Science of Poverty.